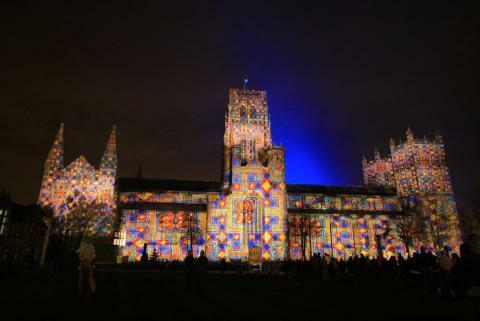 LUMIERE returns with a spectacular raft of installations and projections to illuminate Durham's buildings, streets and public spaces. Local and international artists, lighting designers, and community groups will breathe new light into the city with a breathtaking series of lightworks. This year's festival is certain to be just as popular with artworks sprawling right across the city in a sprinkle of winter magic. The light creations will range from large-scale projections, to neons, to installations using the latest LEDs, created by artists and lighting designers from near and far including pieces created by artists from the North East. Getting into Durham to enjoy the sights couldn’t be easier as we’ve got extra evening buses to make your journey nice and easy, plus we’ve got some great value tickets too, including our £10 Family Day Ticket - covers up to two adults and three children under 16. Our Angel 21 service will run at least every 15 minutes throughout the evening as far as Newcastle Bank in Birtley, with buses departing from Durham Bus Station. Our Castles Express X21 service will run hourly from Durham Bus Station between 7.05pm and 11.05pm, plus our Angel 21 service will run every 30 minutes throughout the evening. Our Castles Express X21 service will run twice an hour from Durham to Bishop Auckland via Spennymoor with buses leaving on the hour and half-hour from Durham Bus Station. Catch our 15 service with buses at 7.35pm, 8.50pm, 10.05pm and 11.15pm from Durham Bus Station. We’ve also got an extra journey from Consett to Durham on Sunday evening at 6.45pm from Consett and 6.59pm from Lanchester Village Green. We’ve got extra buses running on our Durham Diamond 16 service to give an evening service to Stanley every 30 minutes from Durham with buses leaving at 25 and 55 minutes past the hour from Durham Bus Station. Our Prince Bishops 20 service will run every 30 minutes throughout the evening from Durham Bus Station, and we'll be using larger buses. Unfortunately, road closures in the city centre will mean that buses won’t be stopping at Milburngate Shopping Centre from late afternoon and throughout the evening during the Lumiere event. We’ll be running later buses on the 265 from Durham to Seaham via Belmont, Hetton-le-Hole and Murton for each evening of Lumiere with buses leaving Durham at 7.50pm, 9.20pm and 10.50pm. On Sunday evening, we’ll also be running extra buses from Seaham, Murton, Hetton-le-Hole and Belmont into Durham, with buses leaving Seaham at 3.10pm, 4.40pm and 6.10pm. We’ve got extra evening journeys running on Sunday evening as well as the usual evening service on Thursday, Friday and Saturday nights. Buses will leave Langley Park from 7.05pm and run hourly until 10.05pm, with buses leaving Durham Bus Station at 7.35pm and running hourly until 10.35pm. There will be diversions between Wednesday 15 and Sunday 19 November.